Asus ZenFone Max Pro M2₹ 12,999 and ZenFone Max M2₹ 9,999 have started receiving new software updates. The updates for the ZenFone Max Pro M2 and ZenFone Max M2 bring the December 2018 Android security patch. Also, the update for the Asus ZenFone Max Pro M2 includes an optimised the camera interface as well as upgrades the touchscreen firmware. For the ZenFone Max M2, the latest software update brings EIS (electronic image stabilisation) for the front camera. The new updates come weeks after the ZenFone Max Pro M2 and ZenFone Max M2 received the November 2018 Android security patch. The software update that brings new FOTA version 15.2016.1812.179 to the Asus ZenFone Max Pro M2optimises text translation and enhances noise reduction on FM radio. The update also optimises the camera interface and upgrades touchscreen firmware. Asus has also brought the FOTA version 15.2016.1812.145 for the ZenFone Max M2 that brings an improved fingerprint registration and optimises the camera performance. The software update for the ZenFone Max M2 also enables EIS support for the front camera. As we mentioned, the latest software updates for both the ZenFone Max Pro M2 and ZenFone Max M2bring the December 2018 Android security patch as well. Both ZenFone-series models notably received the November 2018 Android security patch through their respective software updates last month. Similar to the previously FOTA updates, Asus has said that it is rolling out the new software versions for the ZenFone Max Pro M2 and ZenFone Max M2 would be pushed “batch by batch.” This means the new update will reach your handset in the coming days. Moreover, you can check its availability by going to the Settings menu. The Asus ZenFone Max Pro M2 and ZenFone Max M2 were launched in India last month. The smartphones debuted with Android 8.1 Oreo, though the Taiwanese giant is set to bring their Android 9.0 Pie update sometime later this month. 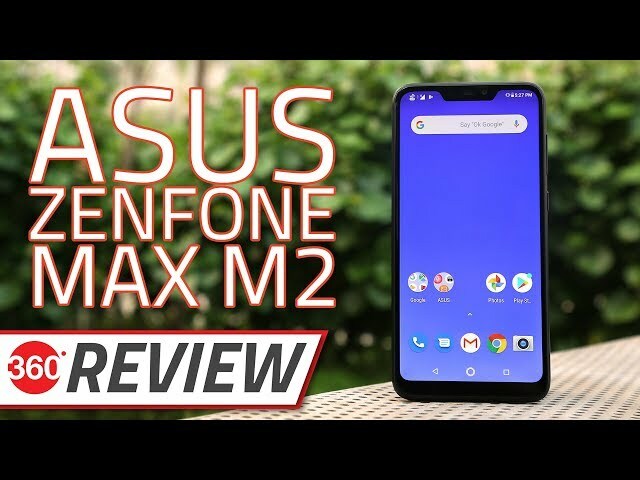 The dual-SIM (Nano) Asus ZenFone Max Pro M2 (ZB630KL) features a 6.26-inch full-HD+ (1080×2280 pixels) with a 19:9 aspect ratio, and a 2.5D curved Corning Gorilla Glass 6. Under the hood, there is a Qualcomm Snapdragon 660 SoC, coupled with 3GB, 4GB, or 6GB of LPDDR4x RAM depending on the variant. On the optics part, the Asus ZenFone Max Pro M2 has a dual rear camera setup with a 12-megapixel primary sensor (Sony IMX486 sensor, f/1.8 aperture, and 1.25-micron pixels) coupled with a 5-megapixel dedicated depth sensor. There is also a 13-megapixel sensor with an f/2.0 aperture, 1.12-micron pixels, and an LED flash module. The ZenFone Max Pro M2 has 32GB and 64GB of onboard storage options that both are expandable via microSD card (up to 2TB). In terms of connectivity, the smartphone includes dual 4G VoLTE, Wi-Fi 802.11 b/g/n, Bluetooth v5.0, GPS/ A-GPS, FM radio, a 3.5mm headphone jack, and a Micro-USB port. Sensors on board include an accelerometer, ambient light sensor, digital compass, gyroscope, and a proximity sensor, with a fingerprint sensor placed on the rear panel. Lastly, the Asus ZenFone Max Pro M2 packs a 5,000mAh battery and measures 157.9×75.5×8.5mm. The dual-SIM (Nano) Asus ZenFone Max M2 has a 6.26-inch HD+ display with a 19:9 aspect ratio. It is powered by Qualcomm’s Snapdragon 632 SoC, with up to 4GB of RAM. The ZenFone Max M2 features a dual rear camera setup with a 13-megapixel primary sensor with an f/1.8 aperture and a 2-megapixel secondary sensor. For selfies, the smartphone has an 8-megapixel camera sensor at the front along with a selfie flash. The Asus ZenFone Max M2 comes with 32GB and 64GB of onboard storage options that both are expandable via microSD card (up to 2TB). Connectivity options on the smartphone include dual 4G VoLTE, Wi-Fi 802.11 b/g/n, Bluetooth v4.2, GPS/ A-GPS, FM radio, a 3.5mm headphone jack, and a Micro-USB port. Besides, the phone packs a 4,000mAh battery and measures 158.41×76.28×7.7mm.